Annual Book Sale - Downtown Manhattan Inc.
Come check out Manhattan Library Association’s (MLA) Annual Book Sale! 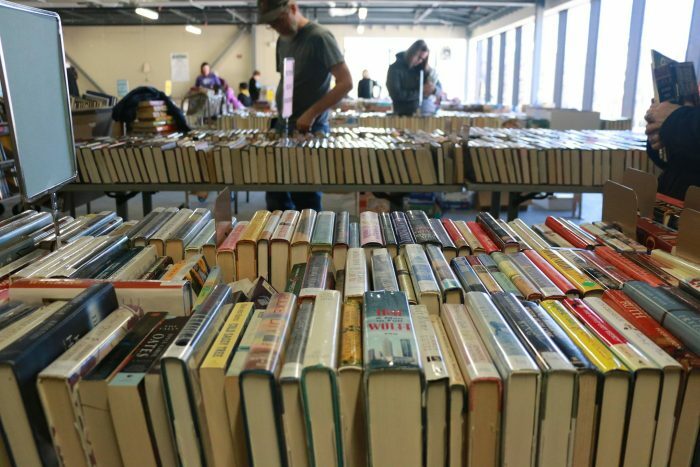 Find thousands of books for sale at bargain prices and support the Manhattan Public Library! Volunteers work year-round to gather and sort donated hardback books, paperbacks, children’s books, DVDs, audiobooks, CDs, and vinyl in order to put on this huge sale for the public. All of the money raised will be used to fund library programs and purchases such as new books, furniture, special events for children, and summer reading programs. In 2018, more than $12,000 was raised to support the library. Friday, Feb. 22, from 5:30 – 7:30 is a special preview night, open to MLA Members only, who will get first pick of the sale items. New memberships will be sold at the door, starting at $10 for an individual, $15 for families, and $25 for organizations. On Saturday, Feb. 23, from 10:00 a.m. to 4:00 p.m. and Sunday, Feb. 24, from 1:00 – 3:30 p.m., the library’s book sale will be open to the public. Coffee table and specialty books priced as marked. Cashiers will be able to accept credit and debit cards with a minimum purchase of just $1.00. Sunday prices will reflect special deals on the remaining materials.